One of the greatest gifts you can give someone is your time. We can make more money and more stuff, but it is our time which seems to be most limited and rare. Each minute gone is a minute that we cannot get back, making it worth so much more than anything we have to give. We spend our time on many things, and so to give time to another person is profoundly beautiful. Beautiful gifts change something about the relationship with have with others. That’s why we give gifts at birthdays, anniversaries, and at special holidays. Gifts are a mark of love, attention, and admiration. We want to express our abiding care for another person when we give them a good gift. The very best gifts are given earnestly, and when they are given from the heart, they not only affect the life of the recipient, but of the giver, too. When you give a priceless gift, you change as much as anyone else. When you give the gift of time, you may experience the most profound and deepest change of all. There is something special about time, we need it to see and listen to others. We do not waste time when we stop to talk to a friend or pay attention to our neighbourhood, rather we are giving a gift to those around us. When we hear the stories of others, we become gift-giving-generous people. When we know that time is valuable and choose to spend it on moments with others, we experience one of the profound purposes for which we were made. As a pastor, I sit over coffee with many people in our city. We laugh and we cry, but even more, we are spending time well. I love what I am called to do because I feel like I each moment spent is a gift. In these moment of generous listening and story telling, life finds a new way. Money cannot buy what time well spent can create, and so I use my time with careful, and beautiful, intentionality – and I hope always to spend it on people. The gift of time is never a waste, I’ve learned that it creates something that did not exist before. Like a seed buried, it may be unseen but seeds are full of life waiting to emerge. I have learned that a moment spent on another person is never lost: it builds, restores, and invests. The very best future begins as time well spent. We cannot spend our time from a distance. We cannot see and hear others when we live apart and away from others. To use our time well we need to get closer. To be changed by the gifts we give, we need others. 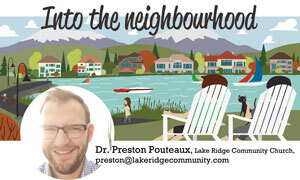 Our neighbourhoods are places where our time is never wasted when we give it away. Building community, friendships, volunteering, watching kids, and walking with others gets to the heart of what we were made for. Your time is valuable and rare. As you spend each minute may you discover the gift of spending your time on others. May you experience the joy of seeing and listening to others and may your gift of time change you, too. Do you want to experience more hope and joy in your neighbourhood? Give it the gift of your time, and you may receive more than you give.